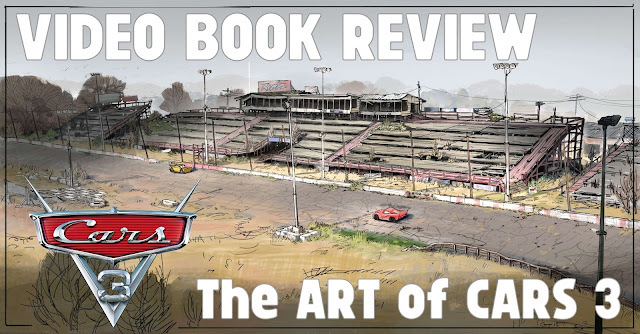 Continuing the long tradition of brilliant "art-of" books from Chronicle, The Art of Cars 3 (the latest in the series), is on shelves (physically and virtually) now. The series provides a great look at the development of the characters, the sets, the story (and more) — The Art of Cars 3 is no exception. After the Foreward (John Lasseter), Preface (Brian Fee) and Introduction (Bill Cone and Jay Shuster), the book is aligned in a similar manner to the film and is broken down into three acts. We enjoyed the book cover-to-cover and cannot recommend it enough. Between the great storyboard insights from Scott Morse (described in our video review) to the early concept artwork from the original version of the film (set in Southern California and involving identity theft elements), the book provides Cars fans a great background into the hard work and creation of the movie. Watch our video review of The Art of Cars 3 embedded below, or direct on our Pixar Post YouTube channel. Be sure to subscribe and ring the bell to receive notifications when we upload our latest reviews, trailer breakdowns and more news all related to Pixar. Pick up this fantastic book (by Chronicle Books) on Amazon. View even more concept artwork, posters and more from Cars 3 in the Pixar Post Gallery. The Art of Cars 3 is a wonderful book that dives deep into the development of the third racing film in the Cars trilogy. Watch our video review of the great Cars 3 themed book by Chronicle Books.